This is the second installment in a short series of articles on photo manipulation in the days before computers. The first explained how photo retouching worked before Photoshop. You know the old cliché: The camera doesn’t lie. But that wasn’t true even before computers made it possible to alter reality with the click of a mouse. As soon as photography came onto the scene—offering an unprecedented opportunity to record the world—people figured out how to use this new technology to distort the world for fun and profit. Read on to discover some favorite photographic tricks from the 19th and early 20th centuries. In 1862, a jewelry engraver in Boston named William H. Mumler “discovered” his ability to photograph the spirits of dead people. Thanks to the rise of Spiritualism—a religious movement premised on the belief that the dead communicate with the living—and the high death toll of the Civil War, Mumler soon found his “talent” in high demand. Clients would come to his studio to be photographed, and when the portrait was developed, alongside the client would be the spirit of a deceased relative, friend, or other person with whom the sitter felt a strong affinity. 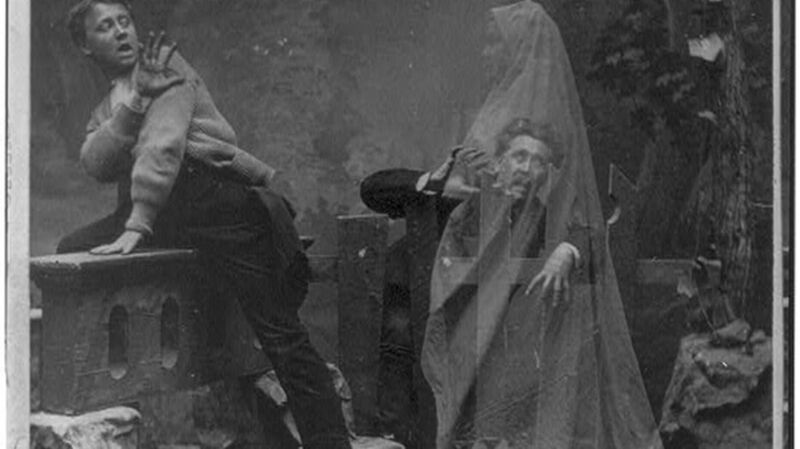 Even the spirits of deceased famous people, like Beethoven, were known to be captured on film. A number of prominent living people also sat for Mumler, including Mary Todd Lincoln, Henry Wilson (Ulysses S. Grant’s vice president), and the abolitionist William Lloyd Garrison. Mumler was accused of fraud by the State of New York in 1869. His trial was covered on the front page of Harper’s Weekly and in newspapers and magazines around the country, largely ruining his reputation, though he was ultimately acquitted. But by the time of Mumler’s trial, a host of other “spirit photographers” had taken up the trade in the United States and Europe, and the practice retained its believers through the 1920s, experiencing a resurgence in popularity following World War I. Meanwhile, books and magazines about photography offered instructions for non-believers on how to produce their own “ghost” photographs. One of the simplest and most popular photographic tricks from the 19th century was the doppelgänger portrait. Photographers could splice together multiple negatives to show the same person several times in a single photograph, but that was a rather crude method. Most photographers used a duplicator—a device that allowed for one section of a negative to be exposed while the rest remained unexposed. Popular Mechanics explained, “The principle of the duplicator is this: Placed over the lens, with the straight edge of the opening perpendicular, it cuts off from use the greater part of the lens. The part that is left throws an image on the sensitive plate which is just about half of what is actually in front of the camera, within the field of view. As the duplicator can be reversed by revolving it, it is obvious that both halves of the view can be taken, one at a time, and that during the exposure of one half, nothing is being taken in the other half.” This technique often left a telltale vertical line along the center of the image—a fuzzy stripe separating the two exposures. “Those who object—as the ladies probably will—to such realistic pictures, may find entertainment in portraying games of chess or cards in duplicate,” Camera Magazine suggested. For whatever reason, a popular setup for doppelgänger portraits involved the subject pulling him- or herself in a wheelbarrow. Mirrors also offered an incredibly simple means of repeating the same person’s image within a picture. Two mirrors set at a 75-degree angle produced five views of the sitter in a single portrait—without any retouching necessary. Performing in Australia in 1863, the British magician Dr. H.S. Lynn—then going by the name Professor Washington Simmons—used the above photograph to advertise his illusion the “Lost Head.” He accomplished this illusion by performing in front of a black background and covering with black cloth whatever he wanted to appear invisible to the audience. Called Black Art, this stage magic technique worked the same way as black background photography, which in the 1890s became the favored method for producing many photographic tricks, including decapitations. Like a photograph showing a man playing cards with himself, a double-headed portrait could be easily created with the use of a duplicator. W. Butcher and Sons even sold a camera with a built-in duplicator, which they advertised with the image of a two-headed woman. “One of the most amusing tricks is to produce the photograph of a bottle in which stands a human being,” columnist Richard Penlake wrote in the February 1909 issue of Photographic Topics. Penlake was not alone in thinking so. In 1897, a book about stage magic and photographic illusions instructed readers how to achieve what the author called “the most curious illusion of all” by masking a negative for double exposure, with the person and the bottle photographed in sequence front of a black background. One odd trend involved transforming a person into a statue by etching and retouching the portrait negative. To capture the most stone-like photo, The Year-Book of Photography and Photographic News Almanac advised in 1885, “The hair must of course be powdered, and doubtless a powder puff applied to the face is advantageous to give the portrait its alabaster appearance.” The subject would then be photographed posing behind a pedestal or a piece of cardboard painted to look like a pedestal. Alternately, the photographer could layer a negative of a pedestal over the negative of the person to achieve a similar effect before scraping off the undesirable parts of the image. While women are the subjects in most examples I’ve found of this trend, the occasional man was also game to see himself in statue form. In the late 19th century, European expatriate photographers in Cairo began to offer novelty portraits with the subject posed in a sarcophagus with only his or her face showing. New York World reported in 1899 that every “enterprising” Cairo photographer produced these portraits “for his American patrons,” as “The mummy pictures are considered graceful and appropriate souvenirs of a trip to Egypt to present on returning to the friends at home.” But Americans weren’t the only ones eager for these souvenirs: The Archduke Franz Ferdinand (yes, that Archduke Franz Ferdinand) posed as a mummy during his 1896 trip to Egypt. According to British and American media coverage of the trend, photographers in Cairo used actual sarcophagi to create the portraits, “a hole sufficiently large for the face to show through having previously been cut in the richly-decorated monumental case,” reported the Yorkshire Telegraph and Star in 1899. The paper noted, however, that “Ingenious photographers vary the picture by obtaining a photograph of a mummy,” and some likely used prop versions of the cases. Once the trend reached New York—thanks to the influence of a wealthy society lady named Mrs. James P. Kernochan, who popularized the idea in 1899 after a trip to Cairo—photographers would either superimpose the subject’s face onto a photo of the mummy, or pose sitters inside a life-size cutout of a sarcophagus. Models of the sphinx were also popular.